What’s up everybody! 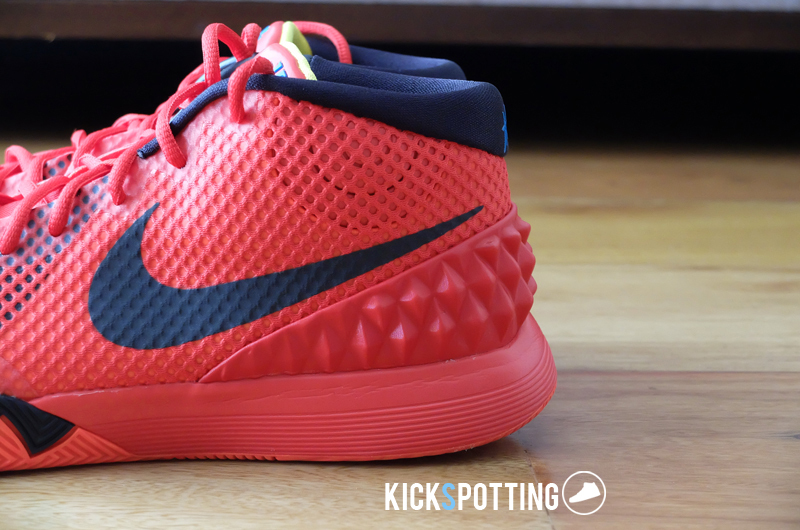 We’re back with the the Kyrie 1 review. About 2 weeks ago, we showed you the trial runs for the Kyrie 1 set up by Nike PH and Titan, where we got to experience the different features of the shoe on court through specific drills and scrimmages. After a few more runs on these, we’re now ready to share our thoughts with you. Let’s get to it! 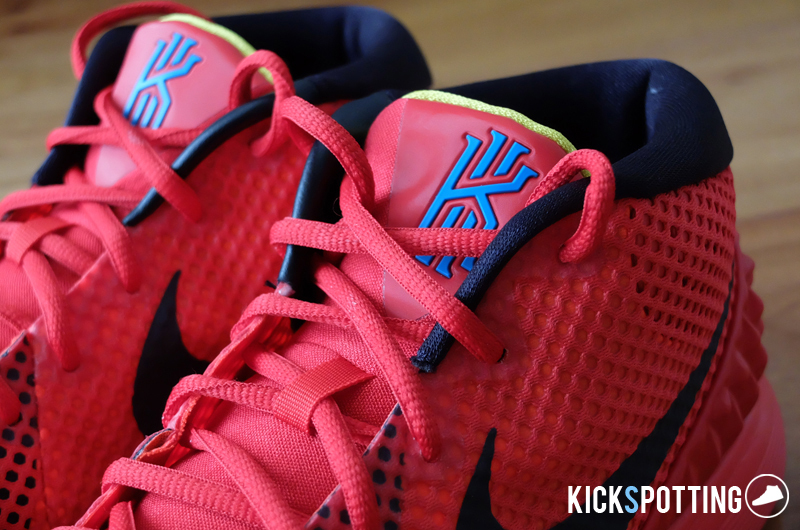 The Kyrie 1 features zoom in the forefoot and phylon in the heel. Right off the box this set up felt good and comfortable right away. It didn’t feel too bouncy, but I could feel the zoom unit right away. I didn’t feel any need to break them in, in terms of the cushioning set up, and they were good to go the moment you lace them up. I actually liked the court feel on these and I could always feel the zoom unit when I was running up and down the court. The phylon foam in the heel also provided good cushioning for your landings. Not too soft and not too firm as well. 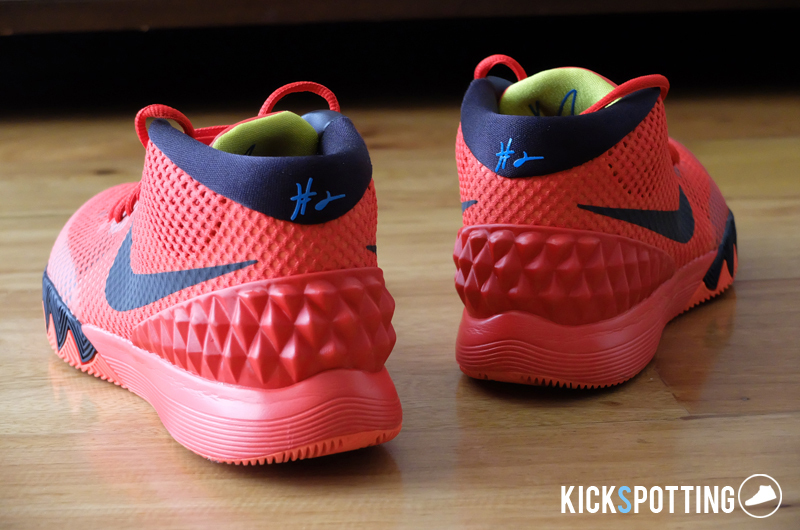 Overall I liked the feel on the cushioning on the Kyrie 1 and it provided a comfortable ride on all my runs. Gets a little tricky in this part. 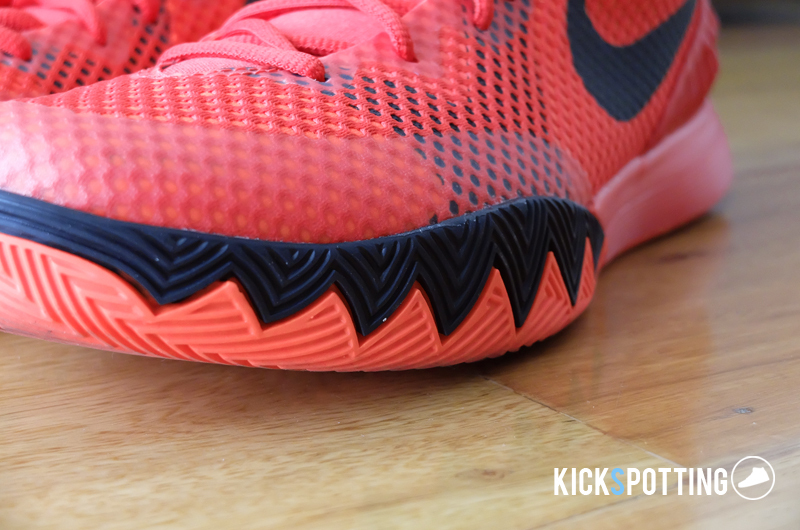 The Kyrie 1 fits true to size in length but it gets a bit narrow around the forefoot so you could go a half size up. Putting them on the first time was hard and it really felt very narrow up front. After a few minutes on the court, they actually form to your foot and they instantly give you a really good fit and lockdown feel. That narrow feeling quickly went away and you’re left with great fitting shoes that hug your foot really well all around. 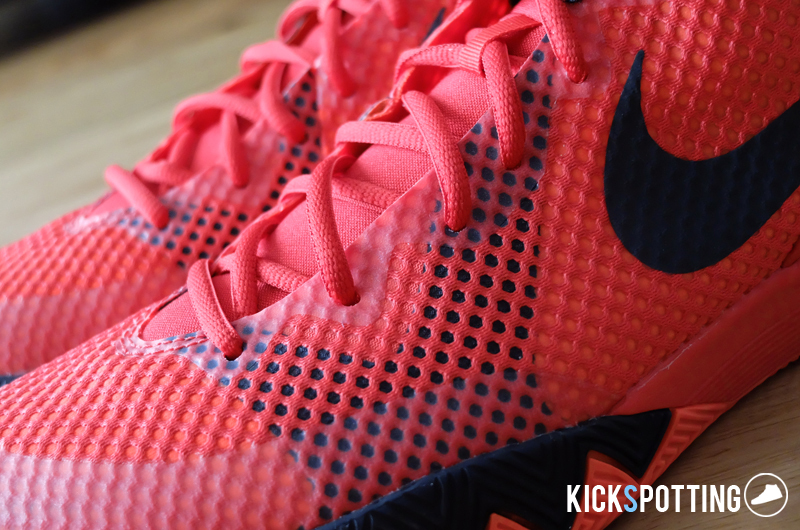 The upper is made up of hyperfuse with mesh overlays for added support and stability. The angular heel counter fits well and wraps around your heel quite nicely. I was able to move freely without and slipping while still having the support needed and it did not feel stiff at all. 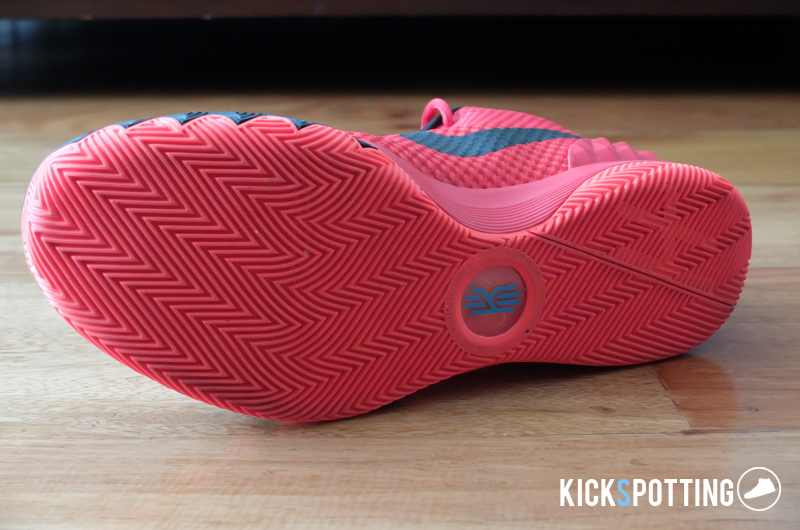 Lockdown in the midfoot is also good and you get that snug fit without any pain or being too tight. I did feel a little pain on the front of my ankle when I laced them up tight up to the top loop. I don’t know if this was because of the tongue padding lacking or the height of the lacing just happened to hit that spot on my ankle. Nothing major though. Mesh is present outside but you still have a layer of fuse making up the upper with a few open areas for air flow. Most of the open areas are around the ankle and the material on the tongue and toebox gives added breathability. Nothing too great, but it’s not bad either. Not an issue for me and I didn’t really feel any hot spots. The best part of the shoe. 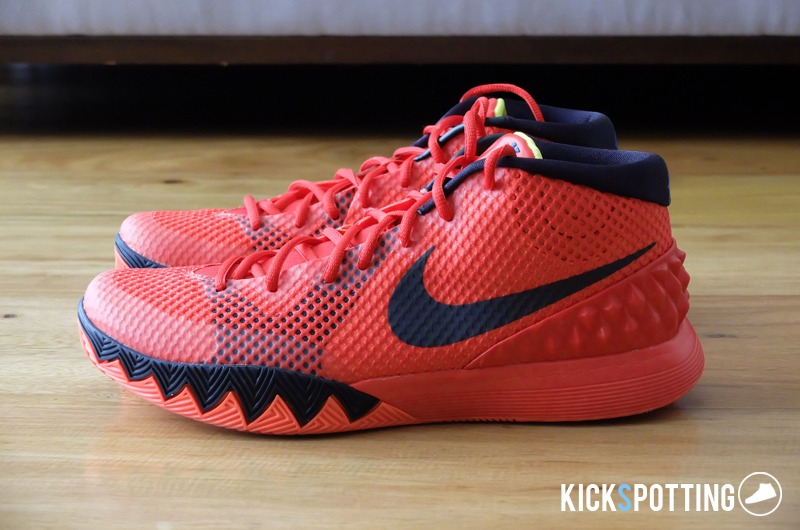 If you want to move like Kyrie and keep defenses on their heels, you really need a shoe with great traction. 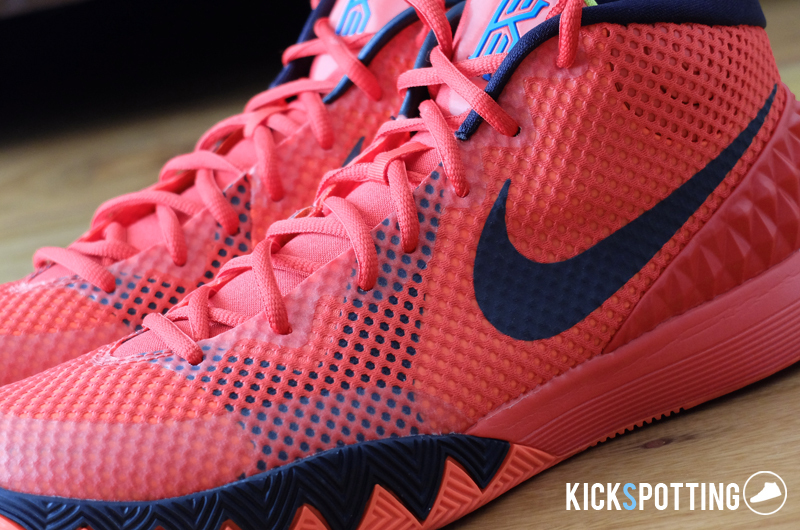 The Kyrie 1 was designed with traction all over. It uses herringbone pattern all over the outsole with a sort of slanted and curving direction that goes all the way up to the forefoot and wraps around the sidewalls. This allows you to make those quick stops and change of direction no matter how you do it. Traction was great and I really felt it on the lateral movements, push offs, and step backs. It has that bite to it that you need so you can stop and quickly change direction. I had quite a few runs already and I still get that squeaking sound on the floor. Sometimes that’s all you want to hear. This definitely was made for the guards and quick players out there. Good overall support which is also provided by the great fit. I always felt my foot locked in the whole time and the shoe really formed to my foot. The hyperfuse material provided that lockdown on the midfood without restricting any movement. The forefoot frame does its job really well and keeps your foot right in place. This is the narrowness that you’ll feel the first time you put them on but will quickly mold to your foot for that perfect fit. The heel counter also adds support and I didn’t experience any slipping on all my runs. I also liked the added padding around the ankle area which gives you extra comfort. Lastly, the midsole provided enough stability for good support. 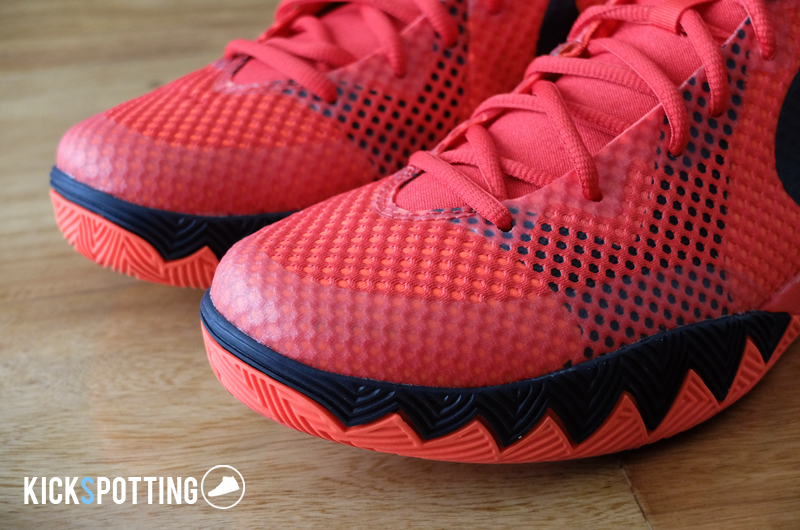 Overall, the Kyrie 1 is a good shoe that provides all the basics you need to perform well on the court. The cushioning setup is comfortable all throughout, it provides a good, snug fit, good support all over, plus it has great traction. The best part of the shoe is that you get great value for its price of only P5,795. The shoe is perfect for guards and players who love to change it up and be quick on their feet. And it looks good too. Definitely a welcome addition to your rotation. You can pick up a pair now at Titan stores, Nike outlets and other retailers around the metro for P5,795. Good start to the Kyrie signature line. Bang for the buck right here. You get a good performance shoe all around.